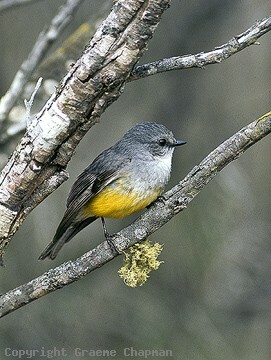 Like the Eastern Yellow Robin, Western Yellow Robins inhabit forests and woodlands but also range into drier scrubland such as mallee further inland. They occur in far south-western Australia, as far north as Shark Bay and east to Israelite Bay - they are also found in South Australia on Eyre Peninsula where the principal habitat is mallee scrub. 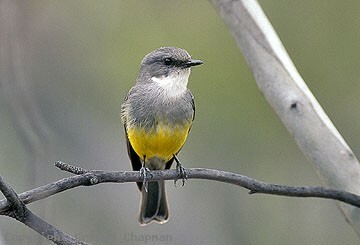 In my experience, Western Yellow Robins are somewhat shyer than their eastern counterparts, or perhaps they are just harder to locate because they lack the penetrating piping call so well-known in the east. These two species are very similar in many respects - there have even been moves in the past to combine them into one. They are both sedentary, live in permanent territories and indulge in co-operative behaviour at the nest. 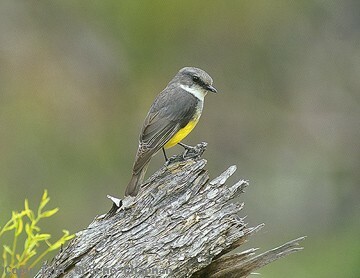 394201 ... Western Yellow Robin, Yardea South Australia. 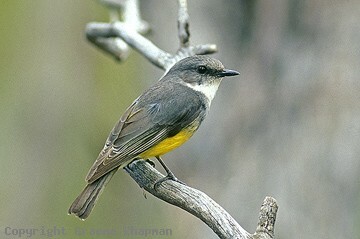 394203 ... Western Yellow Robin, Manmanning, W.A.